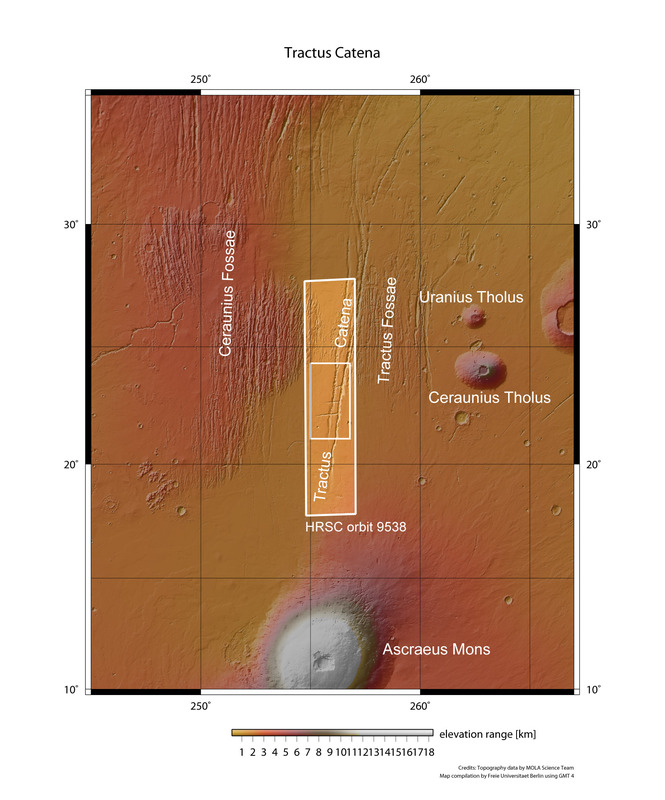 In the Tharsis volcanic region, almost the size of Europe, the Martian highlands have arched up into a shield several 1000 metres high as a consequence of volcanic processes. Quite a few unusual topographic features can be observed there. 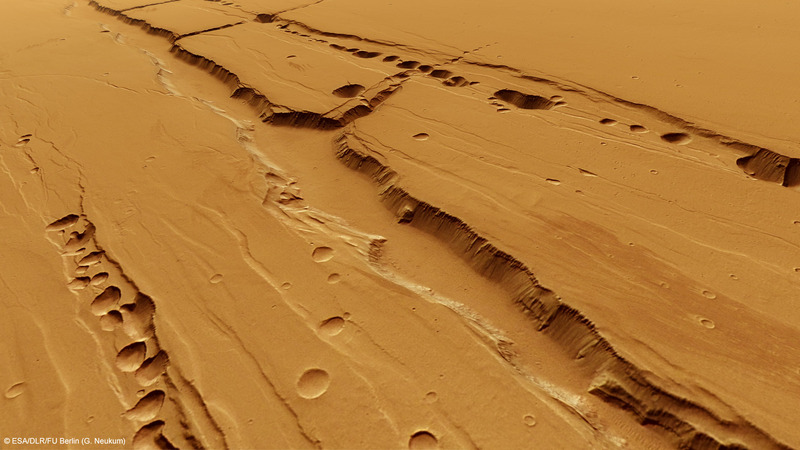 Over the past year, the High Resolution Stereo Camera (HRSC), operated by the German Aerospace Center (Deutsches Zentrum für Luft- und Raumfahrt; DLR) on board ESA's Mars Express spacecraft, has acquired images of a series of linear fractures alongside chains of craters with depths of up to 1500 metres. 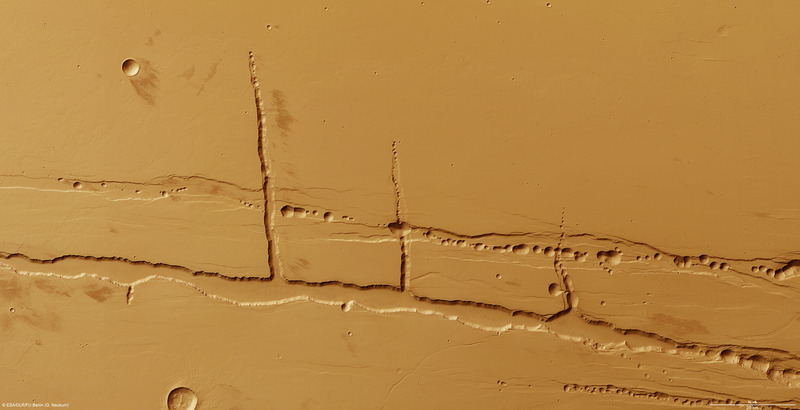 Mars researchers remain divided about the origin of these crater chains. These geological formations, referred to as 'pit crater chains', are visible in several places of the Martian highlands. Although such strings of separate, circular pit craters have constantly been forming along faults or cracks in the brittle Martian crust, the processes leading to their formation might be of a completely different nature. 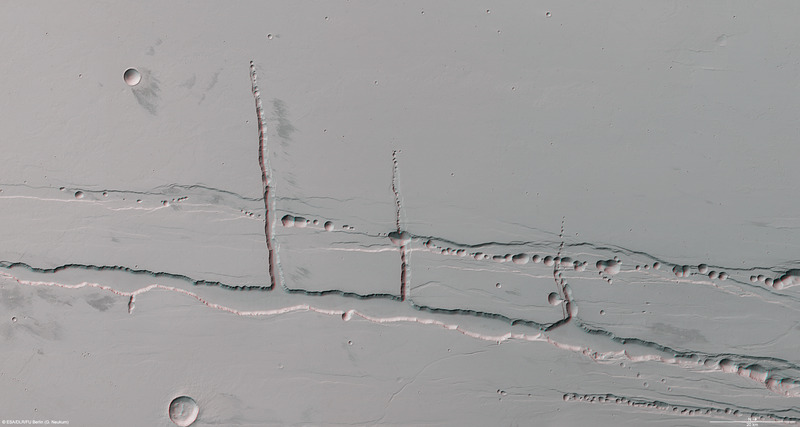 These chains frequently occur on the flanks of shallow shield volcanoes, the bases of which have a very large diameter. When a lava flow cools and solidifies on its surface, its interior remains liquid and continues to flow as if inside a pipe, creating a subterranean cavity. Once the volcanic activity ceases, a tunnel or drained lava tube can be left behind underground. Over time, separate sections along the rocky roof of the tube collapse, leaving circular depressions on the surface. Such lava tunnels exist on Earth as well; in Hawaii, for example. 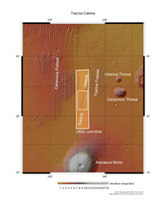 Their formation could also involve purely mechanical processes unrelated to volcanism; as the Martian crust is stretched apart, linear extension fractures are formed, giving rise to circular depressions along their course, where the surface material has 'sagged' downwards. 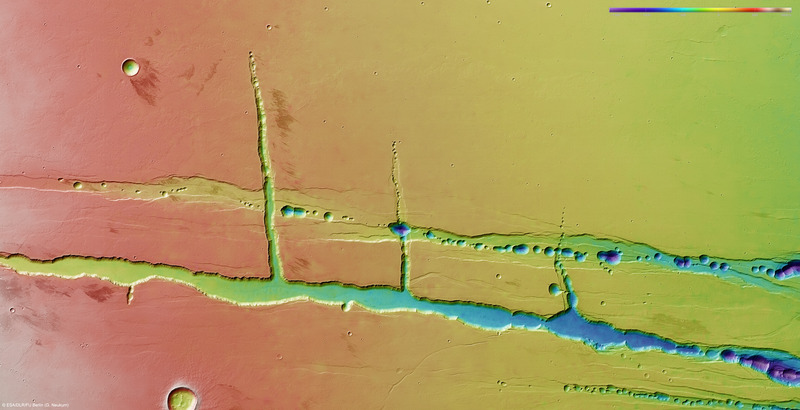 Evidence that the Martian crust has been stretched in this region is provided by the linear faults - isolated blocks of terrain have collapsed into gaps created by the crustal extension, forming the now striking 'terraces'. The presence of extensional tectonics is also expressed in the name Tractus Catena (Latin for 'drawn-out chain'). A third possibility is the effect of groundwater; a similar phenomenon can be observed in karst regions on Earth - for example the sinkholes, called 'dolines', in the Swabian Jura of south-west Germany. The carbonic acid in the groundwater has dissolved the limestone, forming subterranean caverns. Over time, sizeable cavities form, and their ceilings cave in under their own weight. Although there is no limestone on Mars, other solution processes could lead to the formation of similar cavities; here, as with lava tubes, parts of the tunnel ceiling ultimately collapse, generating a row of sinkholes. The existence of water, and its relationship with subsurface cavities, is of great interest - particularly in the search for microbial life on Mars as well as for manned space travel and the 'colonisation' of our planetary neighbour in the distant future. These caves could provide protection from radiation. Microorganisms could survive in such caverns, as they would be protected from the inhospitable conditions at the Martian surface, where the very thin atmosphere is not capable of providing protection against UV and other harmful cosmic radiation. These HRSC images were acquired on 22 June 2011 during Mars Express' orbit 9538, from an altitude of a little over 400 kilometres. The image resolution is about 20 metres per pixel. The images show a section at 23 degrees north and 257 degrees east.